President Donald Trump's odd, mysterious tweet complaining about "covfefe" was on Twitter for only a few hours, but you may be seeing it on the roads long after the meme runs out of gas. Drivers in at least 21 states have claimed "covfefe" license plates -- the number could be higher, but several states don't let you check for availability online. California attorney Craig Cooper took a picture right after he purchased his state's "covfefe" license plate. He wasn't expecting the reaction when his daughter posted it on Twitter. The post has gotten more than 20,000 retweets and 96,000 likes. Cooper was hanging out with his family when he saw President Trump's late-night tweet and they all thought it was hilarious. He thought it would be funny to buy the plate, his assistant told CNN. He still thinks it's funny, now that the initial excitement has worn off, but he hasn't decided whether he will put the plate on his car when it arrives. Demand for the vanity plate was likely driven by the President's tweet, but the online look-up tools don't say when the tags were ordered. It is possible that the plates belong to the people White House Press Secretary Sean Spicer was referring to when he said that "the President and a small group of people know exactly what he meant." Evan Milton wasn't in the know -- he just thought it was funny. The 26-year-old told the Lincoln Journal Star that he heard about "covfefe" around 4 a.m. Wednesday and went to the Nebraska Department of Motor Vehicles website to buy the plate. Forty dollars later, the new plate was his. It wasn't a political purchase. Milton told the paper that he'd been thinking about getting a meme-related vanity plate for a while. "I count the letters of every garbage meme that comes through," he said told the Journal Star. "This whole thing is so ridiculous." "Covfefe" is no longer available in Texas, but the state's personalized plate search tool helpfully suggested alternates. Unfortunately, "covf3fe", "covfef3" and "covf3f3" are also taken. 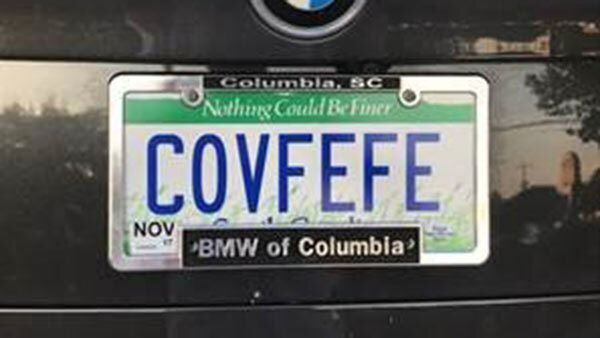 At last check, you could still order the coveted "covfefe" plate in New Hampshire, North Dakota, Pennsylvania, South Dakota, Washington, West Virginia and Wisconsin. The meme may be played out by the time motorists get their new plates, but they'll be doing a service for bored families playing the license plate game on long road trips.